One of the great things about Victoria is the legal and statutory framework it has in place to protect vulnerable people who need support of others to manage their financial and legal affairs. However, it’s important to consider how society and contemporary needs are changing, and to ensure laws in this area are modernised to make sure they protect everyone’s rights and interests. Personally, I’ve taken great satisfaction in seeing a raft of legislative reforms come before Victoria’s parliament this month that will help to provide more protection for the state’s most vulnerable. Three bills were introduced to parliament recently, dealing with Powers of Attorney, guardianship and succession law respectively. State Trustees has worked with the Victorian Law Reform Commission over the last few years to develop an improved legal framework in these areas. We work at the coal face of service delivery in this space. That includes making sure that more than 9,000 Victorians who need our assistance to manage their financial and legal affairs have their interests firmly protected. We drew on our experiences in delivering these services every day to shape our response to the Victorian Law Reform Commission to lobby for these changes. Notwithstanding the importance of these reforms, the most important step all Victorians must take to protect themselves is taking great care with their estate planning and having an appropriate will and enduring power of attorney in place. Powers of Attorney (Powers of Attorney Bill 2014) – The changes brought in by this law will streamline and consolidate power of attorney laws, allowing an individual to use a single document to appoint one or more attorneys to look after their financial and personal matters if they aren’t able to handle those matters themselves. The changes will also permit people to appoint a supportive attorney to help them with their decision making. There will also be new accountability measures, including offences for dishonest conduct in relation to an enduring power of attorney. It’s important to note that things can go wrong if you choose the wrong person to act as your attorney. They may not be up to the task, or, in a worst-case scenario, might actively mismanage your affairs – so it’s imperative these protections are in place to ensure transparency. Guardianship (Guardianship and Administration Bill 2014) – These are the biggest reforms in this area in 25 years, and are all about modernising the law to keep pace with community expectations. This includes allowing a person with a disability to make their own decisions wherever possible, and providing greater flexibility to tailor services to individual circumstances and needs. It includes scope for the appointment of a supportive guardian – a role equivalent to that of a supportive attorney, but appointed by VCAT rather than by the person themselves. 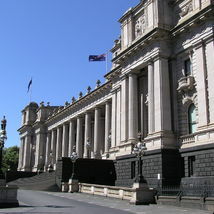 Succession law (Justice Legislation Amendment (Succession and Surrogacy) Bill 2014) – This is the first tranche of proposed reforms to Victoria’s succession laws and includes changes to better define who can challenge a will on the basis they did not receive a sufficient entitlement. Under the current law, anyone asserting that the deceased had an obligation to make provision for them in their will can bring a claim. This can often result in unnecessary costs and delays in administrations. However, State Trustees has been a strong advocate for ensuring the law does not prevent children with a disability from bringing a claim if they cannot demonstrate dependency. We welcome the balance that has been struck in this area. I’m very proud to see these all of these matters being considered by Parliament and knowing that the hard work of State Trustees’ employees has helped to bring about the changes. We will continue to lend our support to improve the fairness, robustness and workability of all laws in these areas for our clients and all Victorians. Having delivered these services for decades we owe a great deal to all the Victorians who have placed their trust and confidence in us to serve them. I can’t think of a better way to repay them than making the system better, fairer and more effective for all.